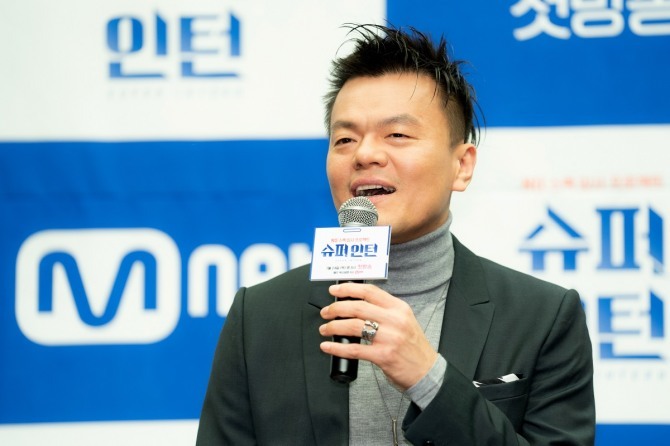 Park Jin-young, the agency’s namesake, founder and executive producer, interviewed 100 applicants ahead of a six-week internship program consisting of diverse team and individual projects. “Since I saw the news last year that the youth unemployment rate in Korea hit 10 percent, I have been thinking of a program that can encourage young people and give them a message of hope,” Park said during a press conference in Seoul on Thursday. 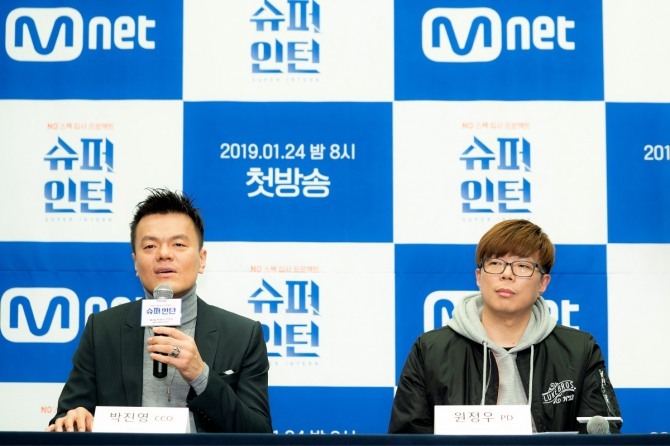 The upcoming show is similar to previous audition programs from Mnet, such as “Produce 101” and “Show Me the Money,” which also offered opportunities for talented young people struggling to realize their dreams. When asked about his criteria for a new recruit, Park said he prioritized the ability to work as a team member over outstanding talent. He added that he also felt the need to overhaul the label’s 20-year-old recruitment system, saying it was no different from those of other entertainment agencies. “When I started JYP, there were only three employees, including Bang Si-hyuk, who now heads Big Hit Entertainment. But they were all extraordinary people who had wild imaginations, didn’t abide by typical Korean education system (values), had once gone crazy over music, movies, concerts and dramas,” he said. “Now the company is bigger, with more than 300 people, but most of them are too normal, I think. Having aired its first episode on Thursday at 8 p.m., “Super Intern” will show us the ins and outs of the JYP office. We’ll even get to see a lounge frequented by acts like Suzy, GOT7 and Twice, as well as lockers and elevators used by artists. Wrapping up the event, Park expressed his excitement about welcoming the new people who recently joined JYP after shooting the show and being selected as permanent employees. “I think the most beautiful things in this world are the eyes of a rookie. I felt the same level of happiness spending time with the interns as when I was part of the audition show ‘K-pop Star.’ Through ‘Super Intern,’ I learned so much from every applicant,” he added.